Paul was always very supportive of Susan opening Market Alley Wines. It was because of Paul's job as the Community Development Director in Monmouth that Susan was able to jump start her business. Paul knew some of the ins and outs of owning a small business as he had formerly owned a software company in Monmouth. Because of this he was able to give Susan the necessary support and guidance needed to open Market Alley Wines. The two can often be seen together as Paul often spends his evenings, especially during the weekend, at Market Alley Wines. They are both supportive of each other's goals, something visible to all who know them. One of Paul Schuytema's former students at Monmouth College introduced him to Susan Kaufman. While a relationship did not begin immediately, soon the two fell in love and were married on April 7, 2013. 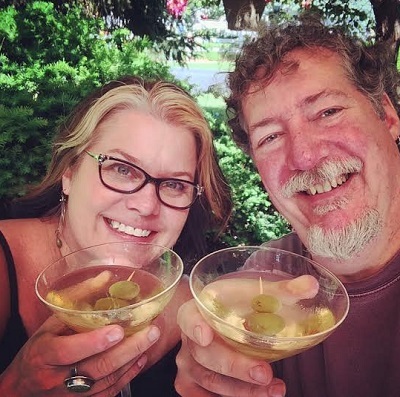 Paul and Susan enjoy a cold drink on the fourth anniversary of Market Alley Wines' opening. Susan proudly wears her wedding band while working at Market Alley Wines. Susan's husband, Paul Schuytema, expresses his feelings for Susan and his favorite moments spent with her.